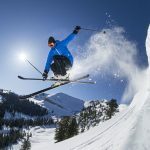 While the fit is subjective for any ski boot, comfort is non-negotiable, they simply have to feel good and be kind to your feet. With a little know-how from a professional boot fitter, this is usually achievable. The Hoji Pro Tour Boots fit (my foot at least) very well straight out of the box. Their relatively lightweight construction doesn’t give up anything when it comes to performance thanks to their 120 flex which was more than capable in bounds and out. Adding to this a 55-degree range of motion in walk mode makes the Hoji Pro Tour an alpine touring boot that seems to have it all. I have an average to slightly wider foot and the Dynafit Hoji Pro Tour Boots fit surprisingly well right out of the box. After inserting my custom footbeds and slapping heel locks on each liner once they were heat molded, the fit was perfect. The 103.5mm last that the Hojis are built on is ideal for my individual foot shape and provides enough support around the arch without cutting off blood flow when the buckles are ratcheted down. A large amount of volume in the toe box ensures that there is enough room for me to wiggle my toes and ensures they stay warm on colder days. The placement of the middle buckle forces my foot down and to the back of the boot to ensure my hell is seated firmly where it should be and remains there no matter how aggressive I ski. While not the lightest alpine touring boots out there, the Hoji Pro Tours are still respectable at 6.4 pounds for size 27.5. The Hoji-Lock System undoubtedly adds some additional weight to the boots but the convenience it provides is well worth the added grams. 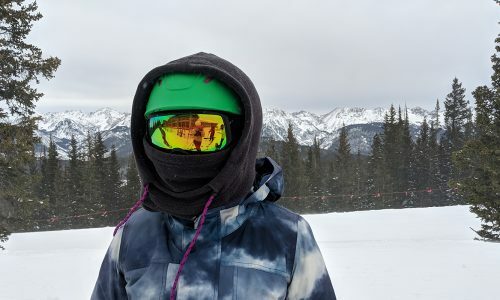 Most ultralight AT boots give up downhill performance in order to gain uphill ease but not the Hoji Pro Tour’s, they’ve hit the sweet spot and found the perfect balance in order to drive fat pow skis in all conditions. 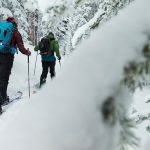 Even though the Hoji Pro Tour Boots only have three buckles they’re able to provide enough foothold and stiffness to adequately drive a wider ski inbounds and out. 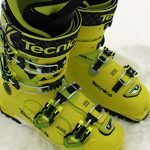 There’s no lack of performance even though this is a lightweight touring boot and I’ve been very impressed with their ability to ski any snow condition at the resort as well as backcountry pow laps. A lot of this is due to the 120 flex rating and a progressive flex which starts out slow and finishes without an abrupt ‘hitting of the wall’ like some boots. Power is something the Hojis have plenty of. 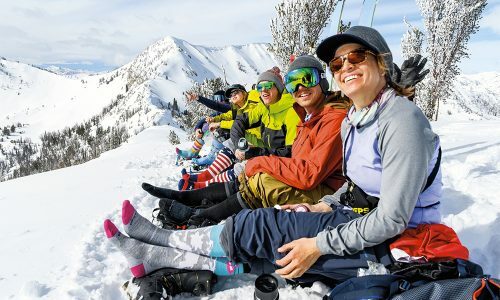 While the Hoji Pro Tour Boots have a very respectable 55-degree of cuff rotation, the secret to their superior walkability is the Hoji-Lock System. The ability to loosen off the power strap, upper buckle and cuff with just the ski/walk mechanism is pure brilliance. 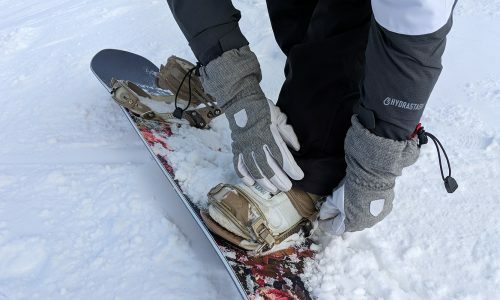 Not only does it save time on the transitions between skiing down and climbing up, but it also allows you to set your buckles and forget them. Once in walk mode, the Hojis have an equal amount of forward-flex as they do back which is crucial for maximizing comfort on the skin track as well as overall ergonomics while climbing. Walkability is the converse to power and the Hoji Pro Tour Boots master both equally well. 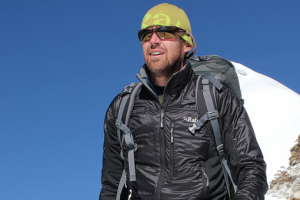 Typically, if an AT boot is heavy enough to ski anything with ease then it punishes you on the uphill. 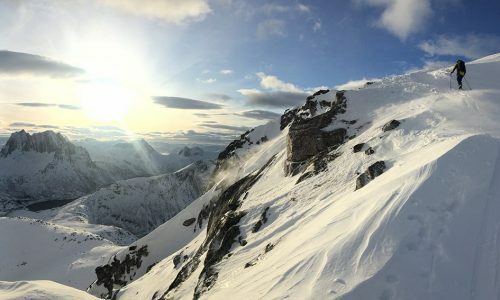 Conversely, if it’s light enough to climb effortlessly then it lacks power on the ski down. The Hoji Pro Tours have mastered both. 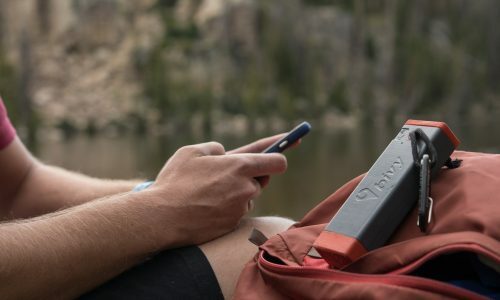 With a 120 flex rating and weighing in at just six and a half pounds, the up is just as effortless as the down. 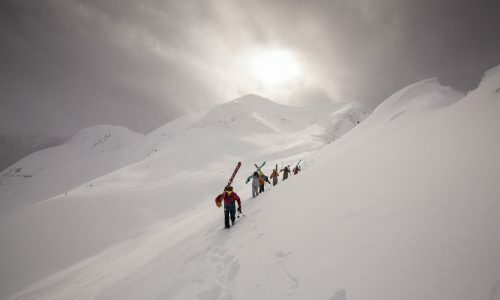 With 55° range of motion in walk mode you can put in big days in the backcountry with ease and they’re still stiff enough to ski the resort day after day. The Hojis are a true quiver of one boot.